As diverse as its friendly residents, Rio Concho West is designed as a carefully planned, contemporary community where you can enjoy the lifestyle of your choice - excitement, relaxation, or a mixture of both - with none of the everyday burdens of home ownership. Quality of community and quality of life are hallmarks of Rio Concho West. Established in 1988, Rio Concho West is located on a 128-acre site overlooking the city of San Angelo. Rio Concho West is a part of Rio Concho Communities, a not-for-profit corporation established in 1966. The Oak Tree, a 12,500 square foot clubhouse offers a wide variety of activities including recreation, entertainment, seminars, and social gatherings. The Oak Tree offers pool tables, darts, exercise equipment, ping pong, a library and computer lab, and a full-service hair salon. It is available for private parties and gatherings for the residents and their families. Nearby lakes, golf courses, parks, shopping centers, and historic sites provide additional enjoyment. Rio Concho West residents must be age 62 or older and meet requirements set forth in our lease. Residents may choose an existing home or build a new home. With six floor plans, residents decide what size of home they want from 1,218 square feet to more than 2,000. Construction meets or exceeds all building standards to ensure enjoyment and comfort. Each two bedroom, two bath home has washer/dryer connections and kitchen appliances including garbage disposal, dishwasher, refrigerator, and stove. 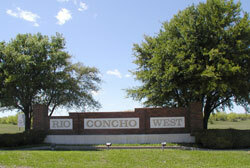 The homes at Rio Concho West are purchased on a lifetime lease agreement basis. Residents pay a monthly maintenance fee which provides for all building maintenance, insurance, management and recreational facility costs. The monthly maintenance fee also provides for water, sewer, trash, cable, security, lawn maintenance, and extermination. Gas, electricity, telephone and taxes are not included in the monthly maintenance fee.